See the best of Key West...and then visit the home of Key West's world famous author. The Old Town Trolley and Ernest Hemingway Home and Museum package is a one of a kind excursion that is sure to inform and inspire while saving time and money! Hop-on, Hop-off at any of the 12 convenient stops situated close to all popular attractions, shops and restaurants. A stress free, fun and interactive tour that saves time and money! See the best first... with this fully narrated sightseeing tour of Key West featuring over 100 points of interest. The Old Town Trolley trolley makes 12 stops so you can disembark along the way for shopping, attractions and dining. Learn about Key West's history and points of interest from knowledgeable, professional tour guides. The Old Town Trolley guides have been extensively trained and are proud to share the history, lore and legends of Key West. Learn about the lucrative ship-wrecking industry. Hear the stories of success and disaster of Henry Flagler's railroad... the railroad that went to sea. Listen to the legends of the fierce Calusa Indians that were said to leave the remains of their enemies on the beaches of Key West, thus creating Key West's first name, Cayo Hueso... Island of Bones. And of course, learn about Ernest Hemingway. Step off the trolley and into Hemingway's shoes for a comprehensive tour of his beautiful home and lush grounds. Ernest Hemingway lived and wrote here for more than ten years. Calling Key West home, he found solace and great physical challenge fishing in the turquoise waters that surround Key West. Go back in time and visit the rooms and beautiful gardens that witnessed the most prolific period of this Nobel Prize winner's writing career. 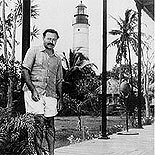 Many of Hemingway's characters and storylines were linked to Key West and the people and places he knew and loved. Educated tour guides give insightful narratives and are eager to answer questions. See the descendants of Hemingway's 6 toed cats, who make themselves at home here. 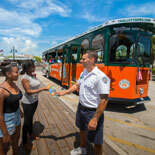 When you are ready, hop back on the Old Town Trolley and continue your tour of Key West. Your eTicket is good for all day use from 9:00 am, with the last re-boarding at 4:30 pm. You may "hop on" and "hop off" as many times as you like during the hours of operation. The is the best way to see Key West and one of it's major attractions. Save time and save money. 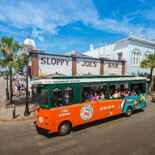 Get your eTickets today and hop on-board with the Old Town Trolley - Hemingway Home and Museum Package! The is the best way to see Key West and one of it's major attractions. Old Town Trolley: Your eTicket is good for all day use from 9:00 am, with the last re-boarding at 4:30 pm. The trolley operates 364 days a year. Closed the last Saturday in October for Fantasy Fest. 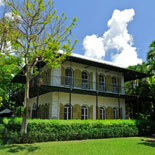 Ernest Hemingway House and Museum is open daily from 9:00 am to 5:00 pm - 365 days a year. Old Town Trolley Tours depart from boarding locations approx. every 30 minutes. Patrons with etickets (voucher) can board at any Old Town Trolley boarding location. Without an e-Ticket voucher you must go to the ticket booth location with invoice order number. Parking is available at Mallory Square and the Westin Parking garage. When purchasing eTickets for groups of 15 or more, please call Customer Service at 800.213.2474 so that we may most effectively serve your needs. Assistance animals, such as seeing-eye dogs, are the only animals that are allowed on board the trolleys.